Tale end of last summer I headed to a local Sea Loch with Alex and had a ball. We were fishing off a ledge into deep water and picking up wrasse and pollock. Later on we would move to an area that had thorn back rays however what sticks out in my mind is the amount of wrasse that I caught in one deep wee spot. It felt like every cast I was pulling up wrasse, in fact it probably was. Here is a wee selection of them..
Been doing a lot of thinking back over the last few days actually. I finally found an old pal from school on Facebook. He had moved to where I grew up from Dundee and lived across the street from me. I was the first person to befriend him in school. He loved UB40 (not the new stuff he would moan, the old stuff) and would talk about his hate of fireworks due to the waste of cash. He was a wee guy and confident, nobody would mess with him and his strong Dundee accent never left him. I guessed he made up a lot of stories about his life back in Dundee but I enjoyed hearing them anyway. We would hang out smoking and drinking and eventually he got mixed up in a rougher crowd. We remained friends and we would run into each other and still chat away. The last time I met him it was when I worked in the Arches nightclub and he was totally wasted. He sat down to chill out with me as many people did at the time and we chatted for a bit, he disclosed he was gay and was struggling a bit with it. That was the last time we chatted. I finally tracked him down before Christmas and sent him a message on Facebook, no response. I tried again last week and sent one of his family members a message asking if he was still on Facebook. She got back to me a day or so later to say that he had been found dead last Thursday. He had moved back to Dundee and it looks like he got himself mixed up in heroin, there has been a spate of deaths over the last few weeks and he may have been a victim of it. I need to get my old UB40 album out! I had dreams of buying a proper dedicated fishing car however my fishing car is our ex- family car that I have just noticed has a horrific oil leak – you know it must be bad when your neighbor is a mechanic and he phones you to say he has never seen the like before! I appear to be collecting an ever-growing list of fishing related activities that I am unable to take part in due to having to sustain an equilibrium between work, family and fishing commitments. As you can imagine the fishing part is probably the lightest out of the three. It does not help after moving to the river trout desert that is Helensburgh. One thing to strike off my list is writing my piece for the Kelvin newsletter which has been penned and sent off to the secretary for his perusal. Next step – get the vice out! I decided I needed a new pair of wading boots at the start of the season. I discovered I had some cash on my Glasgow Angling Centre card so decided that the time was right to splash out. So I bought myself a pair of Scierra X-Tech CC6 wading boots with felt soles and then stuck them in my fishing cupboard and promptly forgot about them as one of my youngest children’s clothes wardrobe was stuck in front of the door which made access difficult. Also, I was doing quite a bit of fishing in the salt as well as walking up a hill so did not want to ruin them. I mean I could still get another couple of seasons out my old boots right? Still get a couple of seasons out of these bad boys? I mean the soles are coming off and their is a 4 inch tear down the side of them however they are not entirely unusable. Anyway, I decided to get my new Scierra X-Tech CC6 wading boots out as I was fishing in my wee burn and had a session in the Kelvin. Both times they were great on my feet, so comfy and the support felt very good. Traction on the rocks was good……I am not going to keep going as I ended up returning them as when I took them off I noticed weird red stuff all over my wading booties. Their was a red layer of what I think was supposed to be rubber that had disintegrated. Bloody typical I thought to myself and looked to twitter to find out what Scierra thought, nae twitter that I could find easily. I then found the Scierrra flying fishing facebook page. I posted my picture of the boots to their page but guess what? They only want pictures of positive stuff not actually sorting out problems. I decided to just dive in to the Glasgow Angling Centre and decided to see what they would say – it was Pike angling extraordinaire Dougie Loughridge who agreed their was an issue and gave me a credit note whilst refusing to touch the boots as they were still wet. I had not even thought of the chances of cross contamination but I guess they can not be too careful. 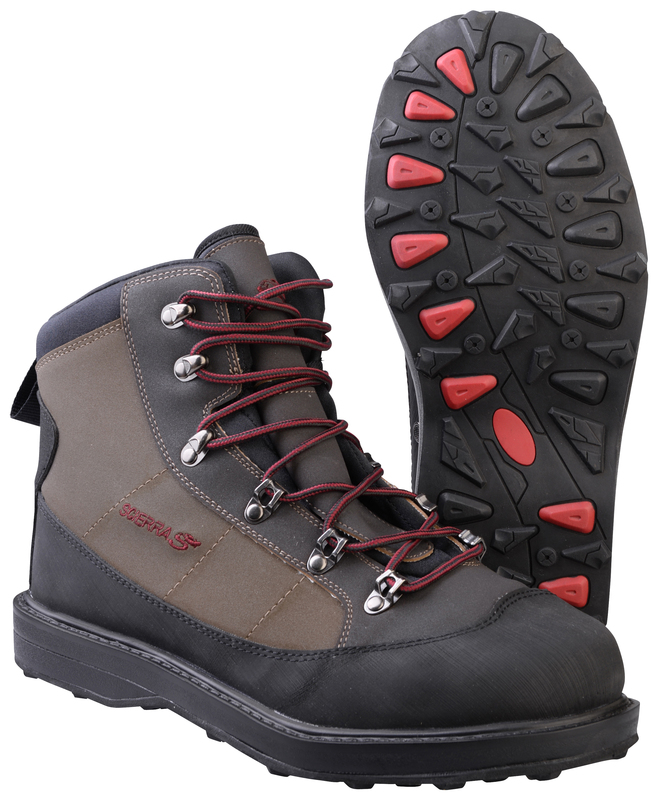 I managed to negotiate a quick discount on the Greys Strata CT wading boots using google, I found them for £50 however due to my stupid hobbit feet being larger than size 7 I could not get them at that price. When I started hunting around they gave me them a ten spot off as obviously me fannying about on my phone was the last thing they wanted to deal with. Anyway, all is well that ends well and Top Service from the Glasgow Angling Centre! I got to the top (bottom?) of the water and the trout that were rising were spooked by my wading. They are not usually that spooky and I decided that it was because usually I walk round the opposite way and coming in this way I was displacing more water when getting into the water. I caught a nice trout and then after taking a wee step forward in the peaty water found myself slipping down what felt like a slide under the water and was up to my armpits, managed to crawl out but was soaked through. Was decidedly disgruntled but fished on without another touch for a half hour. I think it was because of the water but I now noticed the cold wind. I got to the Dam wall after a few plucks and pulls without any fully committing and I changed my fly to a heavy wee bead head. I decided to fish 20m by casting out and letting it sink and slowly twitching it back. I had a couple of savage takes that did not commit and then on my final couple of casts one stayed on. Drove home and then still soaking wet I had to deal with a wasp nest that was under my roof tiles right above where my wife parks the car and the kids get their bikes. Was away for a week to the middle class playground of Centr Parks and was supposed to meet up with Matt from North Country Angler. Unfortunately the only day I could get away was a day that winter appeared to strike with low temps and rain so we decided to cancel. Plus I had somehow managed to break a toe which the kids loved to stamp on to see my tears. On my return home I decided to visit a local wee stream that I have never fished before returning to work. I limped my way out the car and was glad that I was wearing my new wading boots which are a size too big as it means that I had plenty of wiggle room. The stream itself is mostly overgrown and boulder ridden and to be fair I did alright with a few trout caught on the dry fly. Bouldery – great for painful toes! However it kinda felt like the last time I fished a wee stream in that I was fishing over water that should contain a trout but they were not responding. Looking back the next day it was fairly pouring down and I wonder if the impending low pressure has something to do with it. The trout I caught were small but fought feisty, no pictures though. They were not parr as no Salmon or trout get up here to spawn. I sometimes wonder why some wee streams like this hold a lot of trout of good size and others just wee ones, is lack of food or habitat. My wee urban burn I sometimes fish that was decimated by a couple of guys wanting bait for Pike seems to be picking up after a few years and some of those wee pools hold some nice trout. I will come back and give this another bash at some point when my toe means I am not wincing at every step. I stood next to Paul as he lay on the ground moaning in pain. I am not a big fan of sympathy unless it is really bad (giving and receiving) however sometimes when another man has hurt himself and it will pass in a short while there is nothing you can or should say, even saying “that gotta hurt” feels lame. So I stood there gazing at some birds and glancing at Paul just to ensure that I had not misjudged the situation and he was going to require a helicopter rescue. He rolled over on to his knee and muttered something about his leg hurting even more later on and I kinda knew he was going to be ok.
We had been trudging back through long grass after a hard days fishing and just when walking had became almost automatic Paul was in a ditch with his knee connecting to a boulder. My own ankle is a bit off after twisting it somehow as when wading I ended up thigh deep in a bottomless hole and putting it under undue pressure. What this of course equaled was the signs of two guys totally out of practice. Sure, I have been fishing just not in rivers. I have had frequent trips to my wee reservoir and several trips to the Salt however to me “real” fishing is to trout in rivers and I have been doing far too little of it of late. Which is why when I phoned Paul visiting his wee gorge which is deep enough to keep out the wind seemed like a great idea. The stream was boulder strewn with some long deep pools and wee riffles. We spotted some trout when we first arrived however these were pretty much the only ones we spotted all day. The trout were just off for some reason, when fishing these wee burns it is safe to assume that if a wee pocket looks if it has trout in it then it probably will. If the pocket does not then the next one will. Sadly when this happens again and again it means the trout are not playing ball. Lots of interesting technical pools. When we did finally find a feeding trout I managed to prick one and land two in the space of a a few minutes in a few yards of each other. It was a good indication what the rest of the river should have been like if it was switched on. Me fishing a nice pool, I pricked a nice trout here too! As we fished up the river I kept on thinking that this would have been great river for Tenkara and vowed that I would get my Tenkara rod set up for the next time. Looking at the tide times for the week it seems that they should be pretty good for Sea Trout in the salt so a further report to follow.